GMoMA has been working on small-scale public art projects constantly since 2005. Working on the requests of outside exhibition from municipal governments of Gyeonggi Province and related institutes as well as local groups from 2010, in earnest, it has practiced 5 themes of local public art projects for each region since 2015. In the project, museum and locals set the theme together and applied various genres of modern art to it and established a consultation and advisory committee to collect opinions of locals. As a result, ‘Graffiti Art’ and ‘Korean Popular Music’ of Dongducheon City, ‘People of Oido and Silk Road of Ocean’ of Sihueng City, ‘Bridge of Peace-Unable to Forget’ of Imjingang River in Paju City, ‘Symphony of Pyeongtaek’ of Pyeongtaek City, and ‘Jeongok harbor Media Art’ of Hwaseong City were made. 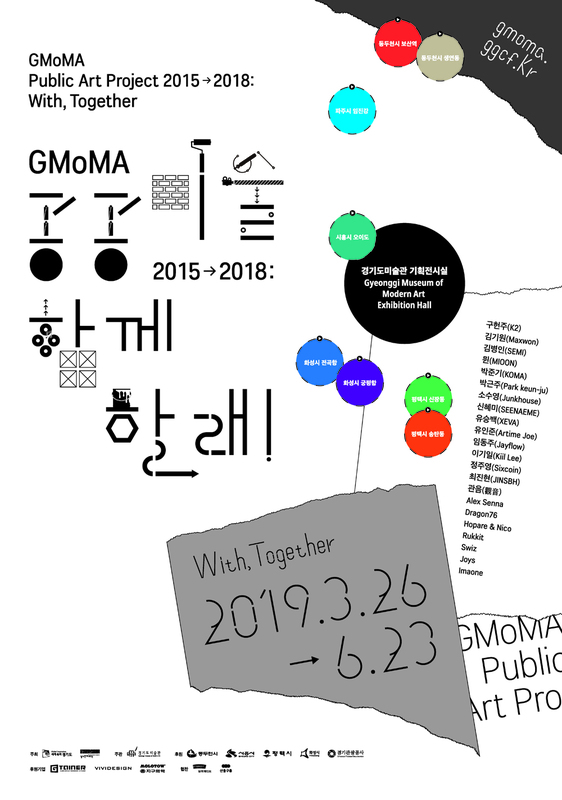 The exhibition 《GMoMA Public Art 2015-2018: With, Together》 was planned as a representation of public art projects of GMoMA from 2015 to 2018 showing local materials and works of artists from each participating region. The art museum does not stay at the bottom line of leaving the artworks in the regions, but continues to explain the inevitable consequences of works and the locals in a way it is being understood in the local background and history. It means, the public art work is not just a piece of work installed outside the exhibition hall but a storytelling work to imply each story of the region. This exhibition is not made solely by the art museum. It is an exhibition made by many people such as artists who worked with us for 4 years, the locals, and other related parties-‘together’ with us.